The best wi-fi video doorbells in 2018 are state of the art gadgets that are on the front line of your home security. They are the sorts of doorbells that James Bond would be happy to use! These turbo charged doorbells can see, hear and track objects (even at night) and provide up to minute security information about any activity outside your front door straight to your smart phone. The best smart doorbells contain an awesome set of power features together with rock solid performance that combine to provide you with fast notifications to bring you peace of mind and a greater sense of security. A wi-fi video doorbell lets you see (and talk to) a person who is at your front door without having to open it. This protects you and your family. With a traditional doorbell, most of us open the front door (after it rings) to see who is at the door. In some situations where your visitor wishes you harm, this is very dangerous. Most doorbells have motion detection capabilities. This means that before a visitor reaches your front door, you can receive a notification that someone is there. If we use a smart video doorbell we don’t need to be at home to find out who has visited us because our doorbell will send us a notification or an email when our doorbell detects motion or someone rings the bell. This includes having the ability to appear as if you are home (by answering your doorbell) which can help to stop opportunistic thieves. Use your doorbell to monitor the “comings and goings” of your children or your elderly parents. As our shopping habits change we are buying an increasing amounts of goods online. This presents a new challenge for us- keeping our parcels and other deliveries safe. In 2016, over 11 million Americans had a parcel stolen. We can also use our doorbell the 2 way audio feature to provide specific instructions to delivery men, which is a much more secure method than leaving a note on your front door. The top smart doorbells incorporate night vision technology. This means that even in darkness, you can see who is at your door with a clear image. Although your wi-fi video doorbell is designed to work as a stand alone smart home device, many of them are designed to work with other devices as part of a smart home or home security system. Most video doorbells have an optional cloud storage plan and some others use micro SD cards as a form of storage. Both of these forms of storage mean that video footage can be stored and shared. This can be helpful for many reasons but one of the main ones is to be able to share any footage with local police. Although there are many smart doorbells that are powered by low voltage doorbell wire, other doorbells are powered by batteries. This makes installation faster because there are no wires to connect. If a doorbell can be truly wireless by using batteries, they can be positioned anywhere on any external door in your house. This is an interesting advantage of buying a wi-fi video doorbell. It is a fast moving and constantly evolving market place where the technology is continually changing. If you like innovation and you are an early adopter, buy yourself a smart doorbell. There are two main disadvantages that come to mind when it comes to these types of doorbells. As long as your doorbell is positioned so that it is primarily focused on the outside of your front yard and not on any part of your neighbour’s property, using video cameras in any form is not illegal. They don’t seem to be a violation of the Fourth Amendment, in which a person’s right to privacy is explained. Because your doorbell connects to your wi-fi, it is vulnerable from hacking attacks. The main example of these doorbells being hacked would be when a stranger breaks into your wi-fi and watches any video that you have stored or watches a “live stream” of your doorbell’s video. Although, it sounds very scary, you take some simple steps to make your house safe. (1) Every year in the USA, 1.4 million home burglaries are reported. That is 1 in every 40 houses. (2) That means that there is 1 burglary every 13 seconds. (3) Most burglaries happen during the day when the house is unoccupied (65% happen between 6am- 6pm). (4) The average cost of stolen items per house is between $1500- $2000. (5) 34% burglars enter through the front door. (7) with monthly “monitoring” fees of $25 and upwards. (8) A decent wi-fi video doorbell costs around $200 and some are much cheaper. 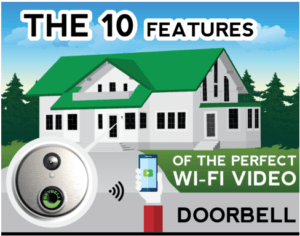 After spending an unhealthy amount of time looking at all dozens of wireless video doorbells, I have created an infographic displaying the 10 features that your perfect wi-fi video doorbell will have! 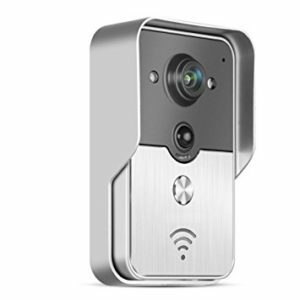 Most of the very best video doorbells in December 2016 will allow you to connect to your Apple iPad or iPhone with an iOS app or most of the other smartphones in the world with an Android app. But they will also let you connect on your Windows 10 laptop or desktop PC or via an Apple laptop or desktop computer. These apps allow you to use your smartphones, tablets and laptops as screens to watch the video from your doorbell on. Other, older models of video doorbells, come with their own small monitors which tend to be about 7” in size. These types of video doorbells are great if you don’t have a smartphone, tablet or up to date laptop. However, in order to watch the video you do need to be in your own home. The most sophisticated video doorbell systems are hard wired into your existing doorbell power circuit. This is because it enables them to provide more sophisticated functions. 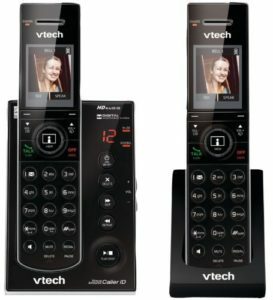 However, many other Most of the video doorbell manufacturers seem to be turning their backs on battery power perhaps because batteries are prone to failure, it is difficult to know exactly when batteries need to be replaced and replacing batteries will require setting the system up from scratch all over again. Any doorbell that you buy, should have a night vision function. The cameras use infrared Light Emitting Diodes (LEDs) to give you a black and white image at night and at other times when there are low light levels. A video doorbell needs to have storage in it as a means of recording videos and photos, mostly when someone approaches your front door. In some doorbells, this storage is provided by an SD card but the best video doorbells come with cloud storage, which on some models comes at no additional cost. Storage enables you to share any photos or videos most importantly with your local police if a crime has been committed. Live feed allows you to watch the video live at any time and not just when someone is coming to your front door. It goes without saying that all video doorbells have a video feed, but what we are interested in here is the quality of it. The very best products have a definition of 1080P but other cheaper models have a definition of 720P. This is the ability to detect that someone is coming to your front door before they have pressed your doorbell. When this happens, a message or notification will be sent to your smartphone, tablet or laptop. The very best of these products will send you a photo or video of every “motion detected” event. Other people live in noisier neighbourhoods and for these people a low level of sensitivity is required otherwise passing traffic could constantly be setting off the motion detector. Your video doorbell will normally be situated outside. It will need to be robust enough to cope with heavy rain, strong winds and burning hot sunshine. The first number relates to dust proofing. A rating of 1 means that the product is not very well protected from dust but a rating of 6 means that a product will not let any dust in at all. The second number relates to water proofing. A rating of 1 means that the product is not very well protected from water but a rating of 6 means that a product will not let an water in at all. So the product with the strongest weatherproofing carries an IP66 rating. Although it is great to be able to talk to and see who is visiting you (before) you open the front door, all of this gadgetry is a little wasted if you then have to walk to the front door and let them in yourself! I mean, how old fashioned! The greatest video doorbells work in conjunction with smart locks, which will open at the touch of a button on the screen of your smartphone or tablet without your having to move a muscle. Yet not all of the doorbells listed below do have this smart lock capability and many buyers do not like this feature because it a smart lock is controlled via the Internet and so it could potentially be unlocked by hackers. The next generation of smart doorbells, caused quite a stir at this year’s Consumer Electronic Show- the place where all the latest or soon to be released gadgets come “out to play”. But what are their new killer features? The first three features are camera and video related and so these new trends are very similar to those found in wi-fi cameras. I think that over the coming year, more and more video doorbells that are launched will be capable of recording footage at 1080p. Premium doorbells, such as this one, have had this feature for a while now, but I think that 1080p will become standard. Motion detection capabilities will improve. At the moment smart doorbells are very good at detecting motion, but they cannot detect what is moving. As the software improves, cameras within the doorbells will be able to tell the difference between a person from an animal in the field of view. Smart doorbells up until now have tended to only record motion detection “clips”- short pieces of video of up to 30 seconds in length. But supposing instead your doorbell never stopped recording footage? Is there a need for this Continuous Video Recording (CVR) or is it a cunning new way that manufacturers have found to get us to spend more money on their cloud storage plans?! As our doorbells gain more power features, their batteries must become more powerful. Like every other smart device, more doorbells will need to be voice controlled. Again, premium doorbells work in basic ways with Amazon’s Alexa and Google Assistant but more devices need to be able to do this and the range of skills need to be improved. The Blink Video Doorbell and the Zmodo Greet Pro allow a user to record a message that can be played if you don’t feel like answering the door. Not bad, eh? IFTTT or If This Then That, is a free app that allows smart products (and so much more) to work with one another. The possibilities are endless and for a more detailed explanation, go here. IFTTT makes our lives easier because it automates tasks and because it can make smart devices do more. 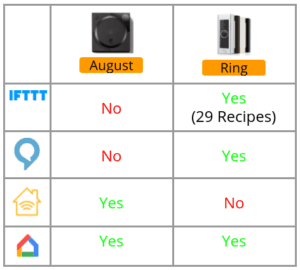 IFTTT contains some terrific “applets” for smart doorbells. An applet is a way of linking two or more products together and they are easy to make or you can use other people’s. I have listed some of my favourite applets for Ring doorbells and the SkyBell HD below. You might not have the devices that these applets link, but I hope that it gives you a flavour of the possibilities. This applet connects your Ring doorbell to your Google Account. If your doorbell detects any motion, the event is marked on your Google Calendar. This applet connects your Ring doorbell to your Hue lights. When your doorbell Rings, your Hue lights will flash. This applet connects your Ring doorbell to your D-Link smart camera.When your doorbell is pressed, your camera will start recording video. This applet connects your Skybell doorbell to your Alexa. Ask Alexa to use SkyBell to record video. This applet connects your SkyBell to your Nest smoke alarm. If your smoke alarm sounds, your SkyBell will start recording video. This applet connects your SkyBell to your Comcast X1 TV box. When your doorbell is pressed, you will be notified via your TV.